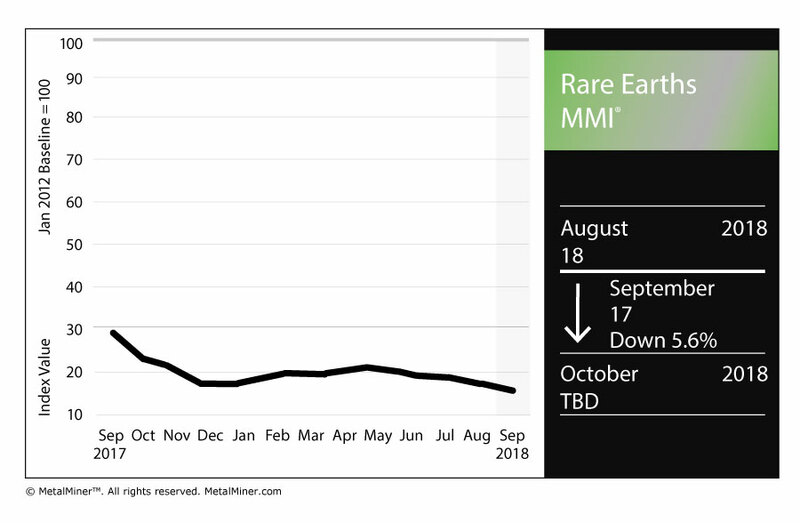 The Rare Earths Monthly Metals Index (MMI) dropped one point this month, falling for a reading of 17. On Aug. 27, China’s Ministry for Industry and Information Technology announced it would increase the quota on rare earth smelting and separation. The quota increased 15% to 115,000 tons, according to Reuters. The South China Morning Post reported on a Chinese company that could get caught up in the escalating trade war between the U.S. and China. Shenghe Resources Holding, as the Post notes, is one firm in a consortium that has invested in the Mountain Pass mine in the U.S. (which was the only operating rare earths mine in the U.S. before owner Molycorp filed for bankruptcy in 2015). If the back and forth results in China imposing a tariff on U.S. rare earths, as the article notes, that could throw a wrench into the consortium’s plans to export materials from the mine to China and, moreover, impact the mine’s viability. The US Federal Laboratories Consortium recently recognized a team of researchers for their work on a rare-earth magnet recycling process. According to Recycling International, researchers from the Critical Minerals Institute and Ames Laboratory were honored with the Notable Technology Development Award for their work on a rare-earth magnet recycling process. ”A unique strength of this technology is that operational hazards and negative environmental impacts associated with acid-based dissolution process are eliminated without sacrificing purity, efficiency and potential economic impact” said Ikenna Nlebedim, the lead investigator for the research, in an Ames Laboratory release on the news. According to the Ames Laboratory announcement, collaboration is ongoing with a commercial partner, Infinium Metals, to produce metal ingots at a larger scale. Per the release, patents are being filed for the researchers’ recycling process. Yttrium fell to $32.88/kilogram, down 0.5%. Terbium oxide fell 0.5%, down to $427.39/kilogram. Neodymium oxide dropped 1.5% to $46,245.80/mt. Europium oxide fell 6.8% to $43.10/kilogram. Dysprosium oxide fell 0.9% to $167.30/kilogram.